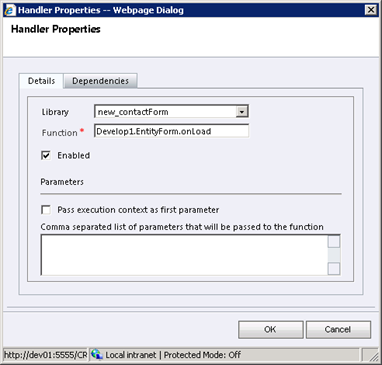 This script simply provides an onload function that will be called from the form, and 'wires up' an event handler to the salutation onchange event. Notice that we don't need to add any messy script to the form event handlers in the CRM form designer anymore, we can do this programmatically. 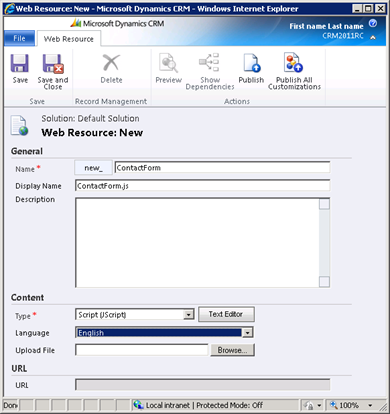 I am going to store my script in the Dynamics CRM ISV folder whilst I work on it – however you can use any location accessible via a URL. The ISV folder is now deprecated and will be removed in future versions, but it is convenient since we can use relative paths to access it. Correspondingly save this file in a folder with the same name as your organisation underneath the ISV folder. E.g. ISV\<YourOrgName>\ContactForm.js. To ease development, you can add this to a Visual Studio project using a File Link. Inside your solution, upload the ContactFormstub.js. Publish your web resource and form customisations, and you'll find that you can edit the ContactForm.js file in the ISV folder with the effects happening immediately you refresh your contact form.